Jeongdong-gil is where many of Korea's modern happenings flourish but also a place that carries the painful memories of the past. It has become a modernized street with a long history, and captivates many with its bright gingko trees and quaint cobblestone streets. Jeongdong-gil begins at the main gate of Deoksugung (Daehanmun Gate) and stretches for 1 km until Sinmun-ro. 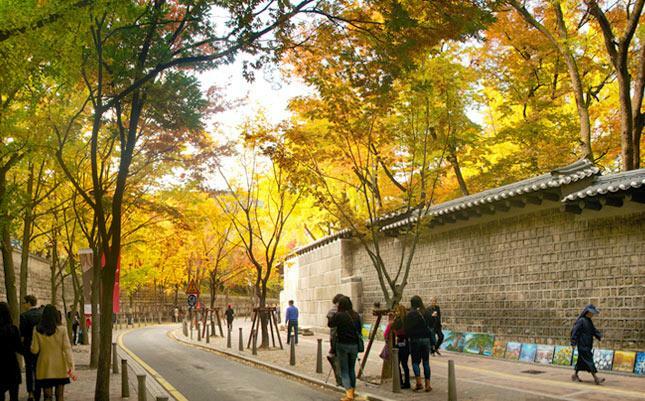 History and nature harmoniously come together to produce a beautiful result with the gingko tree lined cobblestone streets and historical landmarks such as Jeongdong Church and Ewha Girls' highschool. These landmarks along with the modern looking red brick buildings do not seem to be concerned about the test of time and continue to proudly show off their charm over and over. The reason why many modern looking buildings have been planted here is due to Jeongdong-gil's central location. Located in between Seodaemun and Seosomun, the palace walls once acted as a protective layer and naturally, the royal family and many noblemen began to settle in the area. In the late 19th century, Western forces entered the area and began building educational facilities and religious establishments according to Western ways. This is actually where the education of women has its roots as Ewha Girls' Highschool is the first all girls school to be open in Korea. Changdeok Girls' Middle School and the original building of Paichai Hakdang are also located on Jeongdong-gil. The first Protestant church in Korea, Jeongdong Church, and one of Korea's leading theaters, Jeongdong Theater, are all located on Jeongdong-gil as well. Jeongdong-gil is also home to newspaper companies that were forced to close during the Japanese occupation and the tragic remains of the Russian legation. ① The view from the Jeongdong observatory, which overlooks Jeongdong-gil and Deoksugung Palace. Even if the historically meaningful elements of Jeongdong-gil are not considered, the street still has a lot of charming aspects to offer. In order to make walking more convenient for pedestrians, the original 2 lane road was transformed into a one way street in 1999. The street was even purposefully made to be bumpy so that cars could not go fast. Whether its a weekday or the weekend, Jeongdong-gil is brimming with people everywhere. During lunch time, you'll notice many white collar, neck tie wearing workers and this is because of the corporate office buildings nearby. An especially good day on Jeongdong-gil is in the Fall or when the weather is nice. You can enjoy outdoor performances or exhibitions at the Seoul Museum of Art. Along with Myeongdong and Gyeongbokgung, this location is definitely a must-visit attraction for tourists. In 1999, Jeongdong-gil actually won first place for "Pedestrian-friendly Streets", a contest held by the city of Seoul, and in 2006, Jeongdong-gil claimed the top spot for the "100 most beautiful streets in Korea" held by the Ministry of Construction and Transportation. Every fall around October, the "Jeongdong Culture Festival" opens when the gingko leaves are fully ripened and at their peak. Including the Seoul Museum of Art and the Deoksugung Stonewall Walkway, Jeongdong-gil all of a sudden transforms into a stage. Those who attend can look forward to performances from famous singers, treasure hunts, facepainting, and various other activities. ④ On days with good weather, festivals and events take place in different areas of Jeongdong-gil. ⑤ Jeongdong Theater: a representative theater of Korea. See Seoul's history from the very beginning until now. With a focus on the life and culture of those who lived in the Joseon dynasty, the museum offers a wide diversity of exhibitions. nationalistic activities, the "Seodaemun Gyeonggyojang", as they called it, was used as a meeting place. This location is also where Kim Gu was assasinated by Ahn Doo-hee.